We are one of the only practices in Westmoreland County to provide laser dentistry treatments to our patients. With extensive training and certifications, Dr. Mucci and Dr. Campfield are certified to use this virtually Painless, More Natural Dentistry . 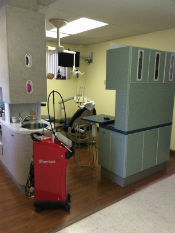 Laser dentistry incorporates state-of-the-art technology in various aspects of dental health practice and treatment. Although laser dentistry may improve the precision of your treatment while minimizing pain and recovery time, the technology has yet to break into the mainstream of dentistry. It is estimated that approximately 5 percent of all dentists have lasers available in their offices today. Dental Fillings: Hard tissue dental lasers may eliminate the need for a local anesthetic injection and the traditional turbine drill. Lasers used in dental filling procedures are capable of killing bacteria located in a cavity and this may lead to better long term tooth restorations. Nerve Regeneration: Photobiomodulation can be used to regenerate damaged nerves, blood vessels, and scars.